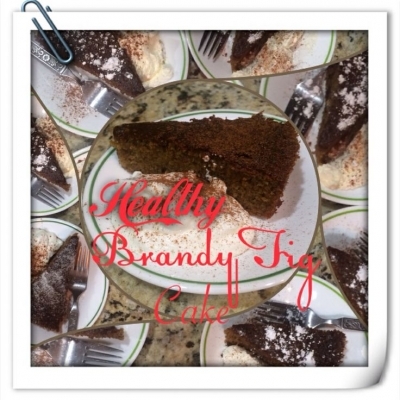 Healthified Fig Cake for the fitness enthusiast! In a VitaMix, grind 1 1/8C rolled oats, 1t ground ginger, 1/2t ground allspice, 1/4t cloves, 1/2t salt, 1t baking powder, 1/2t baking soda and set aside. In a large bowl, cream 1/2C coconut oil, 1/4C truvia and 1/4C dark brown sugar on medium-high speed with a hand mixer until fluffy, about 3 minutes. Scrape down the bowl with a spatula. With the mixer on medium speed, add 4 large eggs one at a time until incorporated. Scrape down the bowl once more. Add 1t vanilla extract, 1t brandy extract, 1/4C Chobani, 4T Apricot Preserves, grated zest of 1 tangerine, and 2T fresh grated ginger. Scrape down the bowl. Mix in the oat flour mixture by hand until just incorporated. Spray a cake tin with coconut oil spray and line it with about 16 dried figs (soak in ginger ale or Brandy Liqueur overnight if desired and reserve the leftover Brandy Liqueur). Pour the batter over the figs. Rap the pan firmly against the counter to remove any air bubbles. Bake for 55 minutes, or until a toothpick inserted into the center comes out clean. Note: It is normal for the top of the cake to "brulee". If desired, when the cake is right out of the oven and still in the tin, poke holes all over it with a wooden skewer. Pour the reserved Brandy Liqueur from the dried figs over the top, letting it seep into the cake.